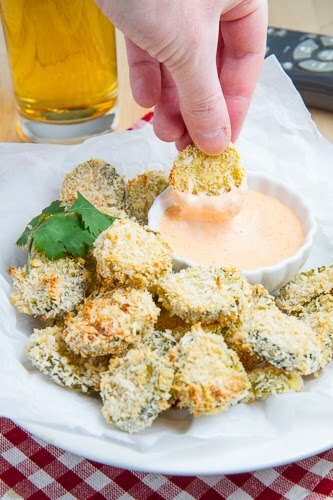 Crispy beer battered baked pickle fries that are perfect for dipping in a cool and creamy ranch sauce. Pickle fries are another common bar food that is great to snack on while watching the big game and I have been meaning to try making them at home for a while now. With the success of the onion rings, eggplant fries and portobello mushroom fries it was past time for me to try making the pickle fries at home! Although pickle fries are normally deep fried in oil I decided to bake them instead with a coating of panko bread crumbs to keep them crispy, though I could not pass up on the beer batter to hold the bread crumbs on. Despite pickles being a bit wet to begin with, these baked fries turn out nice and crispy and oh so irresistibly good! 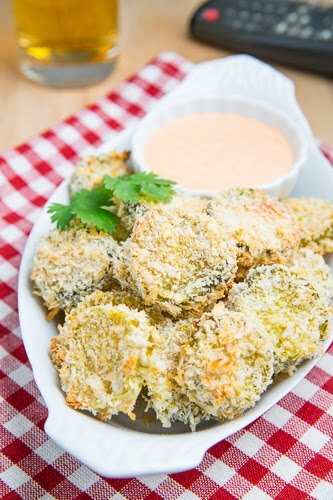 Beer battered crispy baked pickle fries are sure to be a star at your party for the big game and they are so easy to make! The beer batter is really good but if you prefer you could just use eggs to hold the panko bread crumbs on. These beer battered crispy baked pickle are great all by themselves but they also go good with a dip like a spicy chipotle mayo. 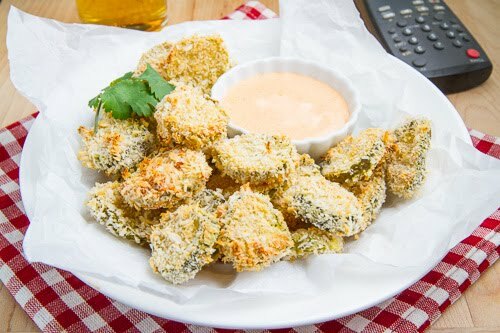 Dip the pickle slices in the mixture of the flour, beer, egg and creole seasoning, dredge in the bread crumbs and place on a rack on a baking dish. Bake in a preheated 425F/220C oven until golden brown and crispy, about 12-14 minutes. For some reason I never realized you could beer batter oven-fried things…but I guess why not? Sounds so tasty! Just wondering…what is the best type of pickle to use?? Anonymous: Both bread and butter and dill pickles work great! Kevin! You are totally speaking my language with these! Love!!!! How do you make your chipotle mayo dipping sauce? It looks delish! Missys828: For the chipotle mayo dipping sauce: Mix 1 cup of mayo with 1+ chopped chipotle chilies in adobo and optionally hit it with a splash of lime juice. Do you turn the pickles during baking time? Stitchin' and a Prayin': I bake them on a wire rack so that you do not need to turn them. If you are baking them without the cooling rack them flip them halfway through. If you substitute ginger ale or carbonated mineral water for the milk or beer , your batter will result in a much crispier crust. 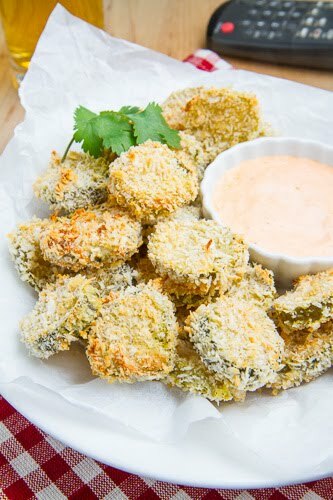 I love the fried dill pickles but haven't tried the baked version yet. Love that you don't have to fry these. Not to long ago had fried ones in a restaurant. I think these sound better and way healthier. Thanks! Lisa Hill: Yes, you can use this recipe and replace the beer with buttermilk or milk. You could also replace the batter with dredging in flour followed by egg followed by the panko bread crumbs. 3/4 cup ginger ale or beer. made them last night for a party, they were a huge hit! no one could believe they were baked and not fried!